Despite her youth, Golden Eagle reveals she’s experienced enough strife to last a lifetime: parental splits, heartbreak, early career pitfalls…. Born in Galway in western Ireland, Macve and her sister were whisked away “in the night” by her mother from their errant father, to live with her grandparents in Yorkshire. 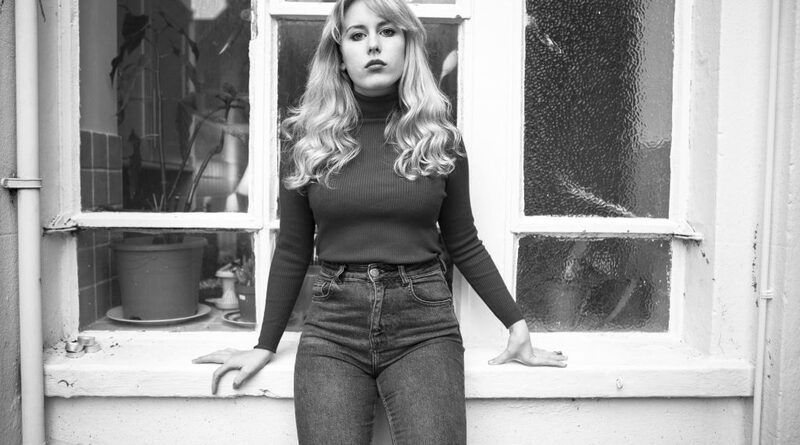 Once in their own house, near the town of Holmfirth, Holly quickly responded to music: “My Grandad was a classical composer, and my mum sang, and she said I was singing before I was talking,” she recalls. Her mother’s record collection – lots of old blues and Bob Dylan – shaped Holly’s impressionable mind, before she herself discovered the likes of Leonard Cohen, Johnny Cash and Gillian Welch. On Golden Eagle, roses wilt, fires die out, skies darken and love, ‘was a mystery that I’d been known to doubt / A puzzle that no one could ever figure out.’ Tracks like ‘White Bridge’, ‘Timbuktu’ and ‘Sycamore Tree’ all refer to a wish to return to a state of innocence. “Songwriting is like therapy for me, it’s a way of turning a bad situation in to something positive”, she states. At the age of 18 Holly moved down south. She worked in a café, while singing on open mic nights. Bella Union boss Simon Raymonde was a regular customer at the café, and had just set up his studio in the basement when he caught wind of this astonishing young talent, with her vocals notes of Welch, Patsy Cline and Paula Frazer (Tarnation), and the timeless melodies, altogether evoking the Appalachian Mountains and the Wyoming prairie rather than the Brighton seafront. “I’m fascinated and drawn to that kind of romantic imagery,” she says. ‘I went to America for the first time last year, to play South By Southwest in Texas, and I really felt a connection with the landscapes over there’. The bulk of Golden Eagle was recorded in Newcastle at the home studio of producer Paul Gregory (of Bella Union label-mates Lanterns On The Lake), with extra recording in Brighton and London. Throughout, Golden Eagle remains beautifully spare and delicate, putting Holly’s goosebump-raising voice centre stage, beautifully controlled yet riven with feeling. On stage, she’s a magnetic presence; it’s not just voice and songs. Audiences who caught her supporting the likes of John Grant, Villagers and Benjamin Clementine – incredible company to keep at this early stage – were doubtless stopped in their tracks. Golden Eagle is surely going to have the same effect. Time to fly. With ‘Chiaroscuro’, I Break Horses have created a fully-realised and utterly captivating tour-de-force. New sonic terrain is compellingly explored by Lindén, where electronic beats and synth-pop soundscapes replace the more shoegaze based-sound of their debut. As a result, there is a marked immediacy and directness to the new songs. As Lindén states: “I found myself writing almost all the sketches on the piano this time.” The music was recorded, mixed and produced by Lindén, with first lp wordsmith Fredrik Balck providing lyrical ideas from the images he derived from the music. Finally, Lindén and Balck would finish the lyrics together. The title of ‘Chiaroscuro’ – meaning “light-dark” – serves as the perfect embodiment of Lindén’s sonic creations, where an atmosphere and mood is created that evokes innermost feelings and thoughts residing beyond the surface reality of the material world. Affecting ballads such as ‘Heart To Know’ and ‘You Burn’ are wrapped in fragile beauty. ‘Denial’ and ‘Medicine Brush’ are sublime synth-pop odysseys whose pulses guide you to new horizons. ‘Faith’ is a dance anthem complete with hypnotic beats, swirling synths and the mesmerising looped vocals of Lindén. “I let myself write both the happiest songs but also the saddest, and then I put them together”, states Lindén. This arrangement of light and dark forms the essence of ‘Chiaroscuro’. ‘Ascension’ is rooted in a gorgeous 80s synth-pop sound, where Lindén’s vocals melt into the lush sonic tapestry. The song deals with love and forgiveness. An irresistible groove lies at the heart of ‘Disclosure’ where a divine purity is distilled in the intricate array of instrumentation. ‘You Burn’ is perhaps the album’s centrepiece, as well as being the opening track, where a brooding darkness envelops the surrounding human space. The delicate piano chords drift magnificently amidst Linden’s searching lyrics. I Break Horses are one of those rare bands capable of conjuring up raw emotion through a sound that is ultimately something life-affirming.